Suburban communities in northern Illinois, home for many of us, continue to grow in diversity - with many people from many races and ethnic backgrounds. Our communities reflect a "mosaic" - a work of art patterned from distinct pieces - but together making something beautiful. We realize, however, that racism, religious bigotry and ethnic hostilities are still present in our communities. 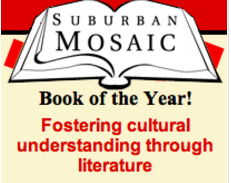 Now in its fifteenth year, the Suburban Mosaic Book of the Year is a program that wants to confront issues - issues of racial and social justice. We believe that education and communication can break down barriers between people. The 2016-2017 Suburban Mosaic Book of the Year selections focus on the barriers and dangers that challenge women and girls worldwide. ​focus on cultural understanding and social justice.